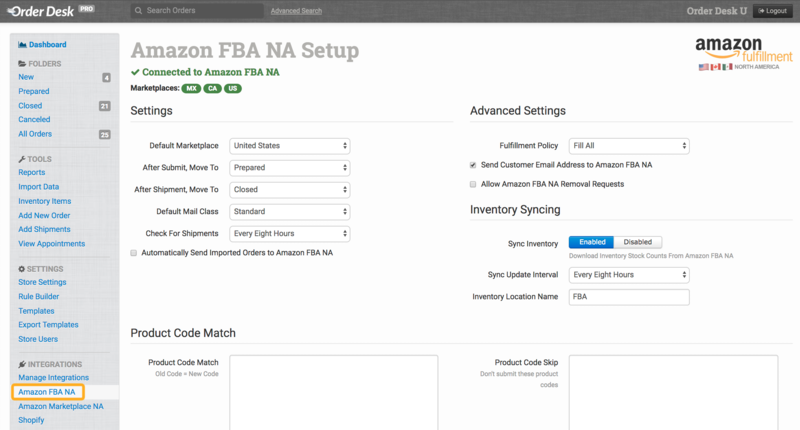 This guide covers the settings found in the Amazon FBA integration. If you haven't enabled the connection yet, see the FBA Setup guide for details. The default marketplace is selected when setting up the integration. If you need to change the market you initially selected, do so here. This default should be set to the primary market in which you do business in the connected FBA region. If you need to change the region rather than the marketplace, connect that region by enabling one of the other FBA integrations. The North America, Europe, Japan, China and India regions are all separate integrations. Select the folder orders should be moved to after they are sent to FBA from Order Desk. Typically this is set to Prepared, but any custom folder can be used. Select the folder orders should be moved to when FBA sends tracking details back to Order Desk about them. Typically this is set to Closed, but any custom folder can be used. Choose the default mail class you want to use for your orders. This shipping class will be used for any orders sent to FBA that aren't mapped to one of the three mail classes they use, if different from Standard, Expedited or Priority on the order. To set up more than one shipping method, see the Shipping Class Match section for instructions. Select how often you want Order Desk to check Amazon FBA for shipment notices on orders that have been sent to FBA. Choose between once a day, every twelve hours, every eight hours and every three hours. When this scheduled appointment runs, if any shipment reports are found from FBA, they'll be pulled into Order Desk and the tracking details will be applied to those orders. FBA doesn't always send their report back right after they've shipped orders, and your appointment time may not be scheduled to run for a few more hours. Please wait a few hours for shipments to show up in Order Desk before assuming there is a problem. If you plan to automatically submit every order to FBA for fulfillment, you can enable this setting. All orders will be sent to FBA as they come in to Order Desk. Import all historical orders into Order Desk (if applicable), and configure your rules and preferences before enabling this. You can submit orders to FBA manually while setting up your store. If you have any other fulfillment services, will have any orders you don't want to send to FBA, or are sending orders to more than one FBA region, keep this disabled. Use rules to submit orders to the appropriate vendor or fulfillment service instead. Fill All: Fill all order items that can be filled and put any items that cannot be filled on hold. They will be shipped when stock comes in. Fill Or Kill: If all order items cannot be filled, the order will be canceled. Fill All Available: Fill all order items that can be filled and cancel any that cannot be filled. 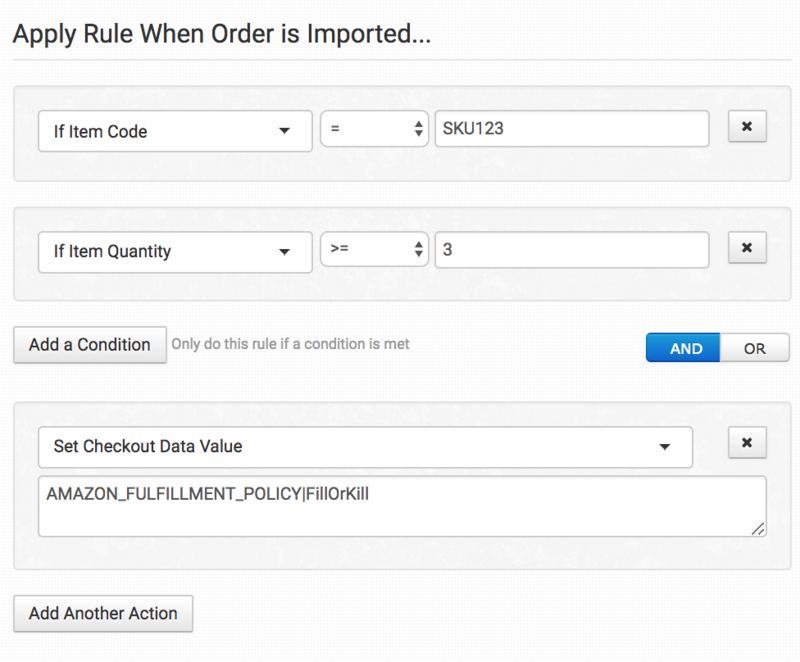 By default, Order Desk will send orders to FBA with a Fill All policy, but this can be changed from the fulfillment policy dropdown in the Advanced Settings section. If you would like to set the fulfillment policy on an order-by-order basis that will override your default setting, set a Checkout Data Field, found in the upper right corner of the order page. More information can be found about Amazon's fulfillment policies here. If you want Amazon to notify your customers when their order has shipped, check the Send Customer Email Address to Amazon FBA option. Some customers do not want Amazon sending these notifications since they are branded as an Amazon shipment. Enable this setting to make removal requests. For in-depth instructions on how this works, please see the FBA: Cancel Orders and Removal Requests guide. For more information about the products and shipping settings in the FBA integration, click through to the next guide in the FBA series: FBA: Products and Shipping.